This Mandatory Declassification Review contains material on genocide in the former Yugoslavia. 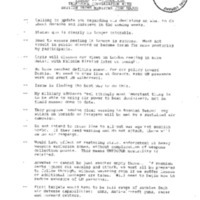 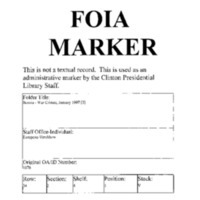 Materials includes a memorandum to the Secretary of Defense regarding a meeting in London and a National Security Council memorandum regarding a paper on Serb ethnic cleansing. 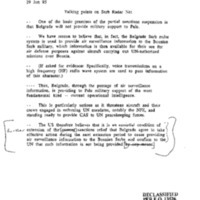 This Mandatory Declassification Review contains material on the genocide in the former Yugoslavia from 1993 to 1995. 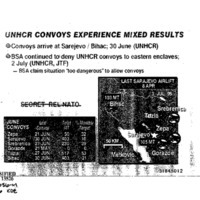 Materials include a table regarding United Nations High Commissioner for Refugees (UNHCR) convoys and a Department of Defense memo regarding Gorazde. This Mandatory Declassification Review contains material on genocide in the former Yugoslavia. Material includes Department of Defense papers on the Serbian radar system and the use of air power. This Mandatory Declassification Review contains material on genocide in the former Yugoslavia. 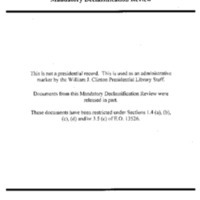 Material includes an NSC discussion paper from July 1995 regarding a post-U.N. protection force strategy to contain the Balkan conflict.